Today’s best lighting designs are really sculptures that illuminate. 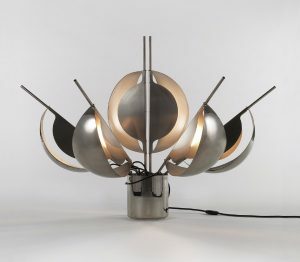 Jean-Pierre Vitrac for Verre Lumiere, Flower Lamp, 1970, chrome metal and stainless steel. 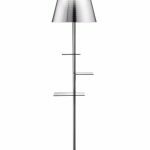 Sabine Charoy for Verre Lumiere, Floor Lamp, 1969, chromed brass and white lacquered steel. The website for R & Company of Manhattan categorizes Jeff Zimmerman’s Illuminated Crystal Cluster as a “hanging lamp,” but it is much more than that. The crystal chandelier is a tantalizingly literal take on the well-established form of the crystal chandelier, a status symbol that enlivens royal palaces and imposing estates the world over. Instead of clear teardrops of leaded cut glass cascading from the ceiling in glittering rows, Zimmerman’s sculpture looks like he has hewn actual oversize crystals from the bowels of the earth and suspended them in the center of the room. The tale of Zimmerman’s cluster neatly captures the tale of how high-end lighting design has changed from the end of World War II to now—it isn’t enough for a light to simply be a light anymore, and thanks to technological advances on many fronts, it can be so much more. It isn’t restricted to the role of a tool that liberates us from dependence on sunlight and candles. Many of the most exquisite contemporary designs aren’t strictly lights at all, but artworks that happen to glow. Postwar high-end lighting designs tilted toward prizing functionality as much as aesthetics. 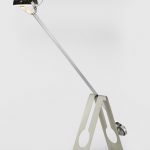 A rare floor lamp created in 1954 by Gerald Thurston for Lightolier, and now available at Patrick Parrish in Manhattan, sports Calderesque colors and unimpeachable utility: its nine shades can point in nine different directions, and the lamp itself is light enough to pick up and move with ease. An exquisitely rare set of three-light Dahlia sconces, made by mid-century glass master and designer Max Ingrand for the Italian firm Fontana Arte and currently on offer at Donzella in Manhattan, look enchanting but never lose sight of their basic purpose: to illuminate. Things started to change by the late 1960s. 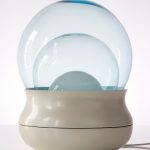 The designs championed by the French firm Verre Lumiere, which was another initiative of Ingrand and was active from 1969 to 1989, pushed the boundaries of what was possible. Sabine Charoy’s brass and steel Floor Lamp from 1969 stands nearly six feet tall and resembles an unearthly piece of industrial equipment but proves itself practical. Its counterweight lets the user wheel its light around at will to loom over a desk or hover near the floor or float near the ceiling. Its light, which sits in a semi-circular metal bowl, rotates in a circle for still more flexibility. Around the same time that Vitrac was toting his cardboard maquette to the Verre Lumiere factory near Paris, American studio furniture artist Wendell Castle was unveiling Pinkie, a bubble gum-pink arch-shaped floor lamp made from fiberglass-reinforced plastic and crowned with a single round bulb. Castle had intended it as a limited edition, but for whatever reason, it didn’t find favor with the public in 1969. Forty years later, Meyers and his gallery stepped up to realize the artist’s vision of a series of eight. “We think he’s a good designer, and people need to know more about him,” Meyers says, adding, “In the end, Pinkie is really not a lamp. It’s a sculpture with a bulb in it,” says Meyers. Then he utters a phrase that Danant uttered about the Flower Lamp, and which other gallerists voiced spontaneously about other objects of theirs, without prompting: “You’re not going to read by it.” Artistic and aesthetic lights existed before the late 1960s, but it took until then for boutiques and galleries to begin offering objects that give light, but aren’t really usable as lamps. And it took until then for elite clients to begin to wrap their heads around the notion of buying them. Michael Anastassiades’s Mobile Chandelier series, which began in 2008 and is offered through The Future Perfect, is another seemingly simple design that was impossible before the LED era. “It could not have been done in halogen light because the globes are so small and so delicate, they require cold light output so they don’t melt the glues,” says Alhadeff. In other words, halogen bulbs might burn hot enough to cause the precisely balanced brass chandelier to weaken and fall apart. Irish artist Niamh Barry was the one who changed his mind. In the designs and prototype that she showed him, Merrill recalls that “she had encased the LED in polished true bronze and covered it with alabaster-like glass. It was really winning.” On the strength of pictures alone, Merrill accepted Barry’s work into his booth at a major fair, and it was an instant hit. Merrill has since invited other artists who work with LEDs to join his roster. Particularly notable is American sculptor Colleen Carlson, who unites one of the world’s oldest artistic mediums—clay—with LED strips that radiate through cross-hatching or mesh. This is not to imply that artists and designers have abandoned other forms of illumination. Sebastian Errazuriz tried using an LED for his Chicken Lamp and discovered that it just wasn’t right for the job. 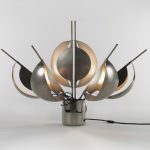 Also represented by Grajales, the Chicken Lamp is a limited-edition successor to a one-off sensation that had its origins in a trash bin in Santiago, Chile. Errazuriz spotted a headless duck in the garbage outside a shuttered taxidermy museum and decided to give it a new life as a lamp. Grajales displayed the duck in her Design Miami booth in 2008 and she says it sold “in two seconds.” The 2014 Chicken Lamp is an homage to the duck, and no LED can deliver the visual punch that a classic incandescent Edison bulb does. “He wanted the honesty of the naked light bulb on top of the chicken, no frills, no nothing,” says Grajales. She has sold eight of the edition of 12 and unlike other art-lights, it’s eminently functional. 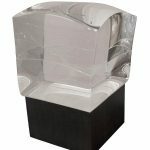 Many have gone to art collectors, and Grajales reports “they actually do use this lamp,” setting it on side tables and consoles.